Strutting our stuff with the next generation! 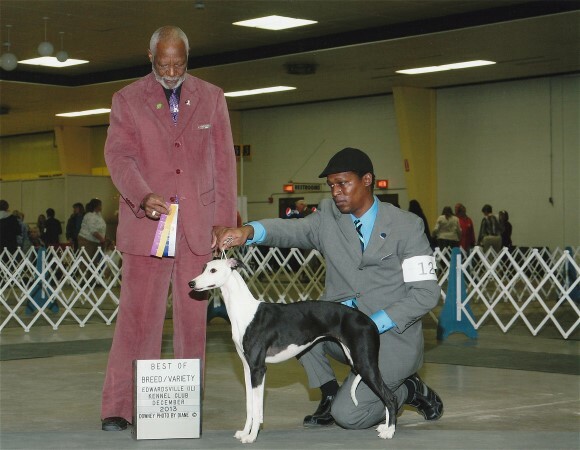 Dena's pups, Solo and Duet, by Scoop (Nat'l Sel, SBIS, Am/Can Ch Jade's Ice Dream Man Of Whyme), have been out and about a bit in 2010, trying their paws at both AKC and UKC shows. 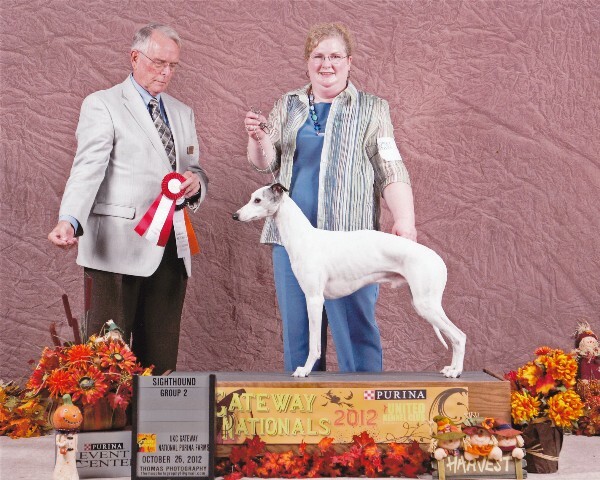 The United Kennel Club came to the St. Louis area in a big way at the end of October 2010, giving us our first opportunity to show in that venue. Solo and Duet did well! 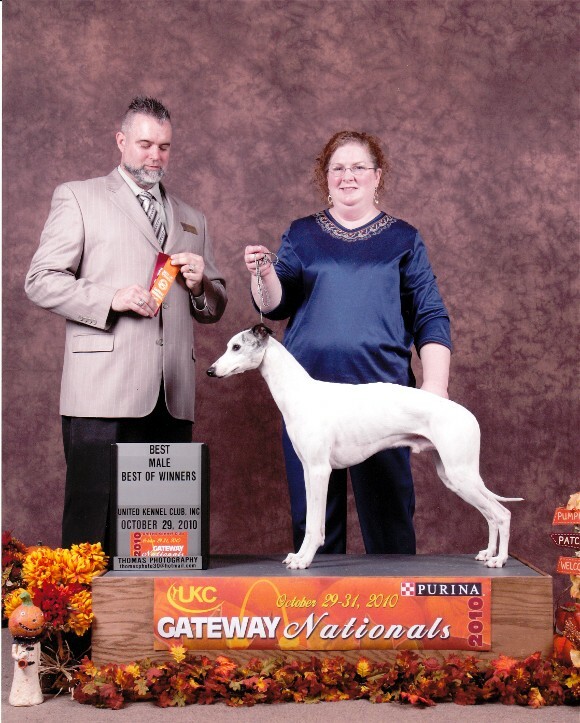 Solo won "Best Male" three times over the course of the UKC Nationals weekend, garnering 85 points. 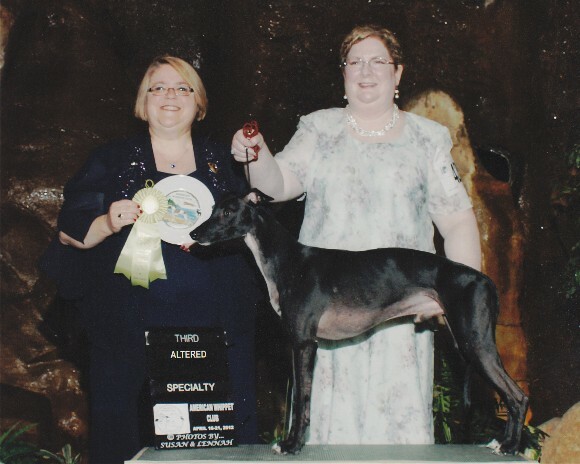 One of his wins was at the Sighthound Specialty! I wish he would have cooperated during his photo shoot. What do you call a male Diva? 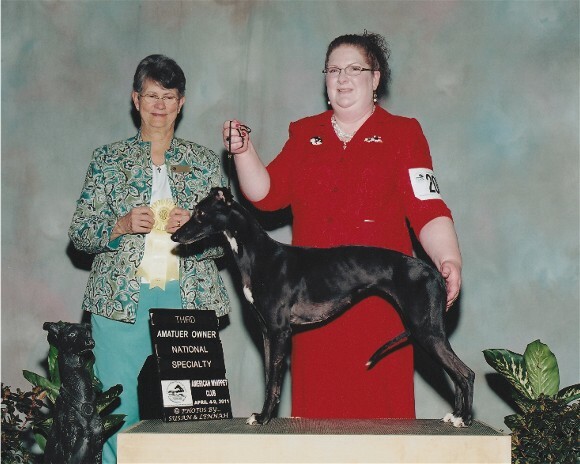 2011 AWC National Specialty, Judge Harriett Nash Lee! at the 2012 AWC Nat. Thank you, judge Mary Alderman! 2012 UKC Gateway Nationals, Solo wins a Gr 2! Thank you, judge William A. Sahloff! Solo's long-sought 2nd major under a 2nd judge! It was a group effort! Mercy, Longrun's Mercy Me; 11.5 months; BOB & Gr3! 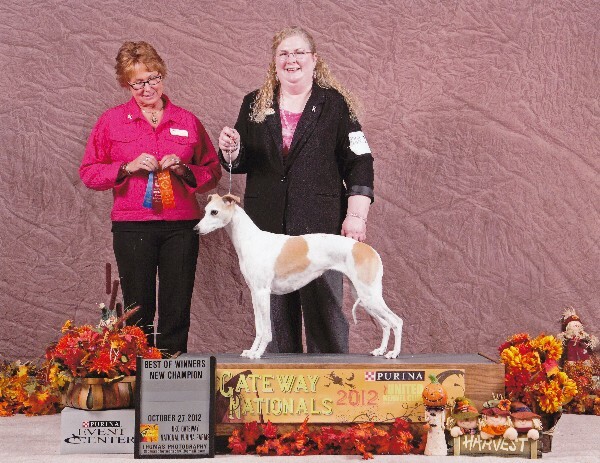 At the 2013 UKC Gateway Nationals, judge Mary-Lynn Jensen. 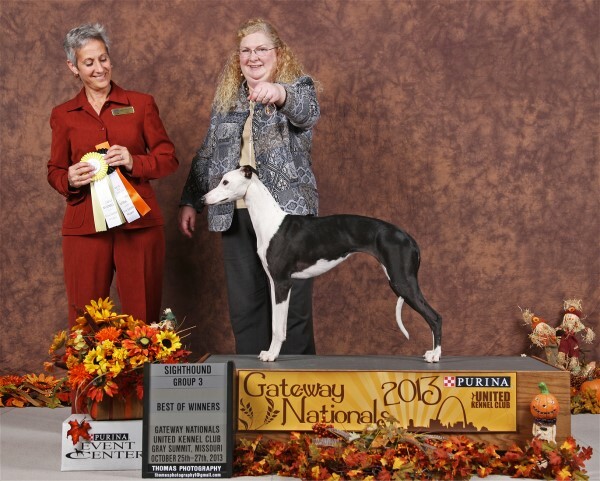 Duet was working on the "Reserve Queen" title for the Nationals weekend, but finally broke through to the winner's circle under Tina Camp for 25 points! Go, cute little redhead! Yay! Both Solo and Duet endured the 7-shows-in-3-days weekend well. 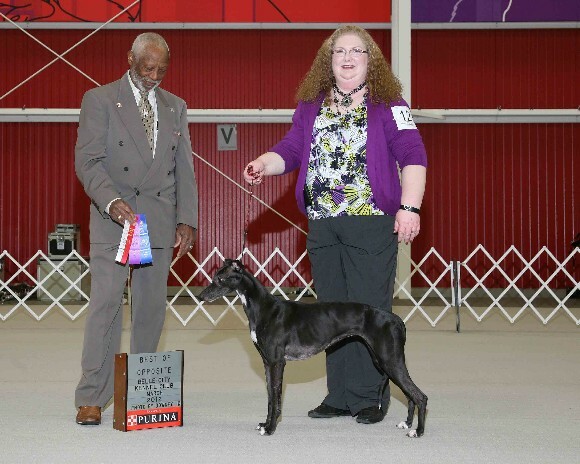 and she wins 2 points under judge Eugene Blake at 7 & 1/2 years! 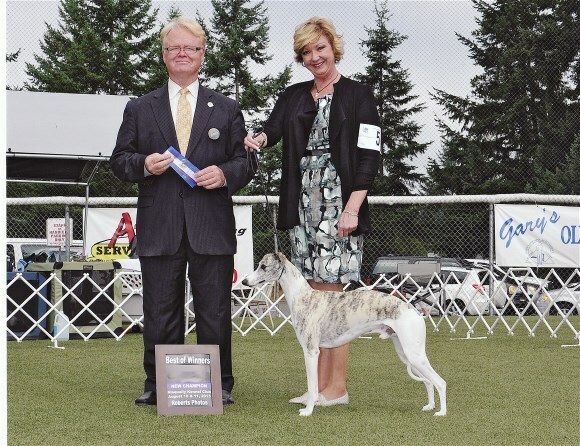 Thanks to judges Mr. Stanbridge & Teresa Kocher (pic)! 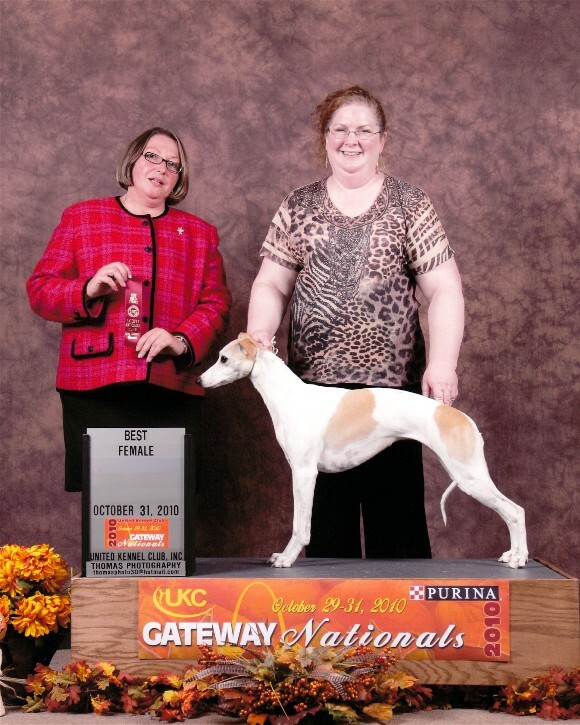 2012 UKC Gateway Nats, Annabel wins 2x & a Gr 3! 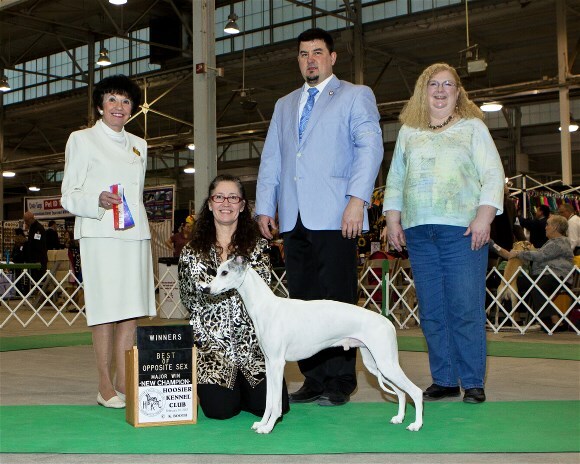 New Ch Jade's Rocket Boy, "Quigley"
Bred & born at Longrun, co-bred & handled by Debi Adams, owned by Karen Hilfiker & Debi Adams. Handled by our friend, Jarnell Carter, Dec. 2013. 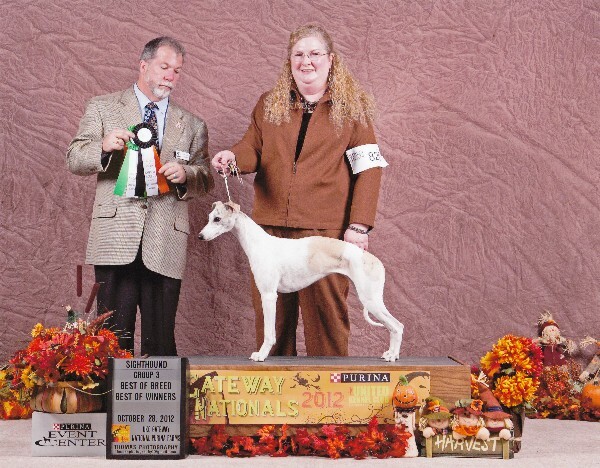 For more info, see the dogs' individual and litter pages.